CROMO Mini DisplayPort Cables feature triple shielded construction with 32AWG conductors for premium performance and corrosion resistance. High quality 24K gold plated contacts and connectors maintain optimal signal integrity and maximum reliability. UHD resolutions up to 4K 4096x2160@60Hz 4:4:4 10bit, including stereoscopic 3D, are supported. CROMO Mini DisplayPort cables are capable of delivering 4:4:4 colour spacing for the most accurate colour representation possible. 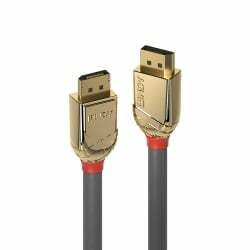 CROMO cables feature sleek chrome design ABS housing to complement the aesthetics of style focused commercial and home applications.